REI was founded in 1938 in Seattle Washington by Lloyd and Mary Anderson. The company is very popular amongst outdoor enthusiasts and owns over 100 retail stores throughout the US. In addition to the retail stores, REI also sells via mail order catalogs and the internet on REI.com. When visiting REI.com, you can always expect to find everything from recreation gear to sporting goods to clothing and the REI Outlet deal of the day offers these items at closeout prices. 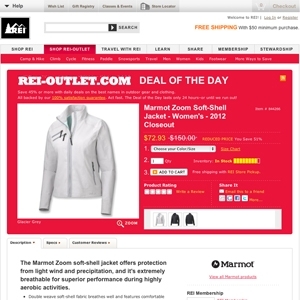 Rei.com/outlet currently ranks #18 amongst sites offering online deals -- HSN ranks #17. In the Sporting Goods category, REI Outlet ranks at #2 -- Sport.Woot ranks #1.